The Bible speaks of a man named Simon who practiced sorcery in the region of Samaria. He had astounded the people with his wizardry and many claimed him to be endowed with power from God. No doubt he made a good living performing for the people. He happened to hear Jesus’ disciple Philip speak one day and lo and behold Simon believed the message. The Bible tells us in Acts 8:13 that he became a follower of Jesus and began to hang around with Philip. Now the “receiving of the Holy Spirit” was not a casual event in those days. When it first came on the disciples earlier in Acts while they met in the upper room it was accompanied by fire and a great rushing wind. So this incident in Samaria must have been a very dramatic scene that impressed all those who were present…including Simon. There comes the baggage. Simon’s whole life had been about earning money through performance. A flick of the wrist here…a little deception there. He has hit the mother load here if he can learn to conjure up some wind and fire with only a little touch. 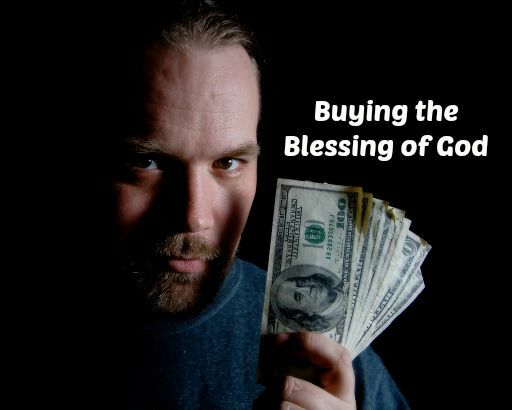 The blessings of God are clearly not for sale. Has money become your tool to manipulate others, including God? He does have a boatload of blessings to give but only to those whose heart is right and whose intentions are pure. Questions: Have you ever made a bargain with God saying, “I’ll give you this money if you do this for me?” How do you make sure your heart is right when giving money? If only I could drop some cash in the plate & all my sins would be forgiven 🙂 Since goes against most of the teachings in the Bible I’m not counting it. “…drop some cash in the plate & all my sins would be forgiven.” Haha…yeah, doesn’t quite work that way (although some other religions may beg to differ). I honestly did this practice when I was in really bad situation (I had no choice). But, I regret it really. I avoid it as much as possible because I know I have to share money selflessly and with pure, good intention. Being raised in the church I have watched people give their rent, and light bill money in hopes of a special blessing. I have always had a problem with that. I have no problem giving money to the church and I believe in tithing but my grocery money is for me and I will never gamble it in exchange for a blessing. “…give their rent, and light bill money in hopes of a special blessing.” I know Petrish and I don’t think that’s what God is looking for. God says that we should take care of our own house first (I Tim. 5:8). I always was of the belief that God, or my God would be very understanding of my financial situation and would not “ask for money.” But I believe that I should always help in WHATEVER way I can, WHEN I can. I would hate to feel so low and desperate in life that I think giving away everything in order to make things better would really work. Talk about getting kicked when you’re down…unfortunately, some people do feel that desperate and get taken advantage of. I think this does give religious institutions a bad name because of the behavior of a few. I’m glad you took this issue on. Unfortunately, I think many who preach “health and wealth” do it to line their own pockets. It is certainly misunderstanding of the Scripture. But before I get too holier-than-thou, I do often find myself bargaining with God (reference my recent post). I feel like I can tell Him what to do and I’ll promise to “obey” that decision – you know, the very decision I handed to Him. I need to be better about praying for His will (not mine) to be done.